In the last lesson we took a look at an easy Boogie Woogie accompaniment pattern. In this lesson you learn an authentic fingerstyle solo in the style of ‘Step It Up And Go’ by Blind Boy Fuller. Again this solo can be applied to a countless number of other Blues songs. All examples are taken from my new book ‘Garantiert Akustik Bluesgitarre lernen’ (published by Alfred Music Publishing in November 2014), which contains many more examples and ideas (available at my website). The melody notes on the third fret are all played with the pinky. If possible add a little palm mute to the bass notes. Then we play the Step It Up And Go melody over a C major chord. 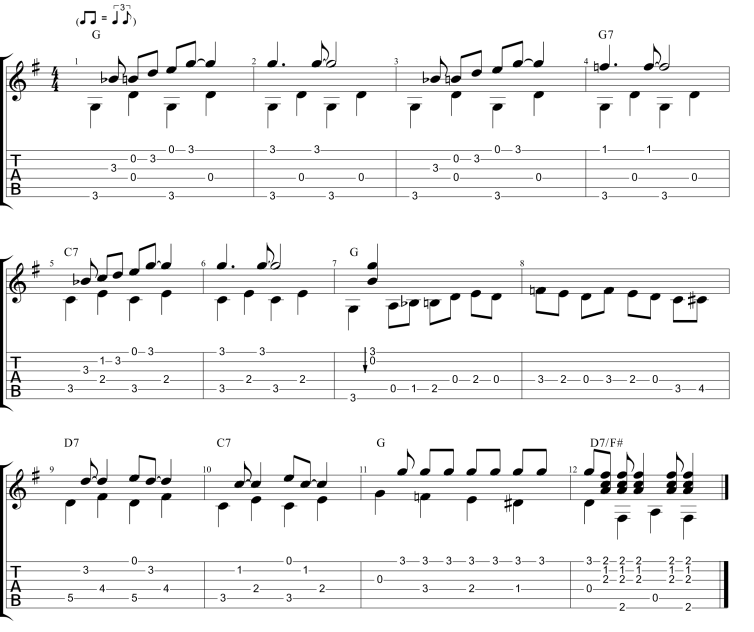 Note that only one note has changed (the C on the first fret of the b string). This note is part of the C major chord we are fretting so we don’t need to change anything to get this note. In bar 7 and 8 we can repeat one of the G figures we just learned or find another little variation. Blind Boy Fuller (1907–1941) is one of the all time greats of Country Blues guitar. ‘Truckin’ My Blues Away’ (Yazoo 1060) is a nice sampler with 14 tracks to get you started. or the Document Records CDs ‘Complete Recorded Works’ Vol. 1–6 (DOCD 5091-5096) (Vol. 5 contains ‘Step It Up And Go’). The JSP-CDs usually have a better sound quality than the ones Document Records.